A suburban Chicago couple was found guilty of allowing underage drinking in their home on the night of a car crash that killed two teens authorities said had been at their house. After seven hours of deliberations, jurors Saturday found both Jeffrey and Sara Hutsell, both 53, guilty of allowing underage drinking in their Deerfield, Ill., home, reported CBS station WBBM. The jury also found the couple guilty of endangering the life of a child and attempting to obstruct justice for lying to police officers the night of the crash. The jury acquitted them of one charge of obstruction of justice for destroying evidence. With the conviction each could face penalties from probation to one year in jail, and fines up to $2,500. The sentencing hearing is set for Sept. 11. The Hutsells showed no emotion when the verdict was read. Prosecutors call the trial a tragic case of parents who have never been in trouble before but are now convicted of allowing teenagers to drink in their home. "It's an even greater tragedy that two young men died as a result of the bad decision of the defendants" said Michael Waller, Lake County State's Attorney. 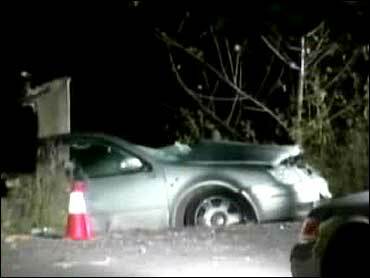 Police say 18-year-old Danny Bell and Ross Trace left an Oct., 16, 2006 party at the Hutsell home drunk and died when they crashed a car into a tree, just a few feet from the house. The couple was upstairs watching television while the young people were in the basement drinking beer and liquor. "These parents didn't lift a finger or do anything to control the access to their residence that night," said chief prosecutor Christen Bishop. "They didn't take keys, call parents, supervise. They allowed the kids to go in and out of their basement, to freely come and go all night long." The jury began deliberating at about 12:30 p.m. Saturday, viewing five days of testimony, 130 photos, and evidence that includes beer cans and beer bottles. During the trial, Jeffrey and Sara Hutsell testified that they had no idea their son's friends were drinking that night. Authorities say Trace had a blood alcohol level nearly twice the legal limit and Bell had marijuana in his system. Prosecutors argued that the couple had to know the kids were drinking at the party because they went to the basement at least three times where there were beer bottles, beer cans and rum bottles. They also pointed out that the couple's son, Jonathan Tyler Hutsell, was convicted twice for underage drinking. But the defense told the jury the couple never saw any signs of drinking, so it was reasonable to assume that they had no idea the teens were doing just that. They reminded the jury that Jeffrey Hutsell testified he didn't condone teenage drinking and indicated that if the teens were drinking, it was their decision. Authorities said the verdict should send a message to other parents. "You cannot host underage drinking parties in your home," said Waller. "The consequences as we learned in this case can be deadly." Many in Deerfield said Sunday that it's a message some parents and teens need to hear. "This community is outraged," Deerfield parent Debbie Hellman told WBBM correspondent Joanie Lum. "When children are underage at your home, you need to take responsibility and know what's going on in your home." But it seems some parents and teens have not gotten that message. Deerfield police say that Friday evening, they arrested six teenagers for underage drinking — three of whom had been guests at the October 13 party at the Hutsells. One was a survivor of that fatal car crash. "You know what? Some people never learn," said Hellman. State Senator Susan Garrett hopes stricter laws will help. She sponsored legislation to make it a felony to serve alcohol to minors in a home, if someone is injured as a result. "Parents can't look the other way anymore and pretend it's all right for children to drink in the home and hope everything turns out all right," said Garrett. That law was passed by the state Senate and House and is awaiting the governor's signature.